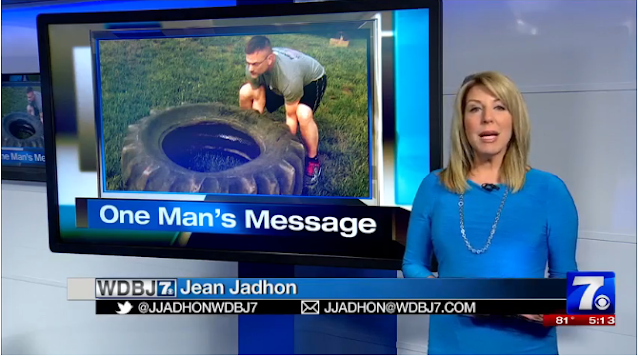 Being diagnosed and living with Multiple Sclerosis is extremely tough, but one Roanoke County man has a message for those who have been recently diagnosed with the disease. Steve Wilhelm is 48 years old and in good physical shape. He does burpees and squats and runs on trails. He also climbs rope and rolls a huge tire as part of his functional training routine. "It started out with some abdominal numbness," said Steve Wilhelm. "Which quickly spread to my feet, to my legs, initially it went all the way up to to my upper lip." Multiple Sclerosis is a disease that affects the central nervous system. Over the years Wilhelm has had issues with walking and upper body strength. "At one time about four years ago I was having about 30 seizures a day a as a result of some lesions that were occurring in the left side of my brain," Wilhelm explained. He does have down days. "At times every one of us with this disease is going to have down times," said Wilhelm. "What I do is allow myself that down time, maybe a little cry or maybe sometimes I feel sorry for myself then I have to refocus on the future." "What I've learned is that In time if you allow the disease to take over without fighting back at all the disease becomes more aggressive," Wilhelm said. "But if you engage things like positive attitude and motivation to get back into your normal routine after a relapse. you give yourself better odds." Wilhelm competes in obstacle races. One race last fall called Rugged Maniac included 28 obstacles such as crawling through mud, climbing ropes and trail running. At home he watches his weight by eating a healthy diet that includes fruits and vegetables. "If I'm an extra 20 pounds heavy, when you have MS and your feet are already heavy it feels like something more," Wilhelm said. He also videotapes his gait when he runs and works on increasing coordination by building muscle. "I work extra hard to regain that coordination through muscle memory because my nervous system has failed but I still have muscles that are functional." "Right now is the time they have to make a decision. They can either chose to allow this disease to go unchecked," said Wilhelm. "Or they can jump aboard and fight this disease through their lifestyle, their attitude, through use of the medical community that's out there and and have a better outcome when they do those things."